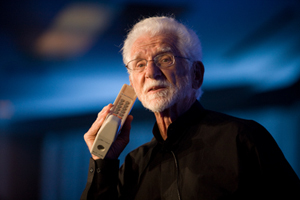 Martin Cooper, who conceived of and developed the first hand-held cellular phone in 1973, is the keynote speaker at the American Telemedicine Association's Annual Meeting. In an exclusive interview, he offered his vision of the future of wireless technology. Did you imagine in 1973 that, in your lifetime most of the people in the world would use cell phones? My colleagues and I knew, even then, that someday everyone one would have a personal telephone. We joked that at some time in the future a person would be assigned a telephone number when they were born – and if they didn't answer the phone, they had died. But the thought that phones would be given away to people was unimaginable. Even in 1983, when the first commercial cell phones appeared, a simple cell phone that talked and listened – but that's all – cost $3,900. The first cell phone contained several thousand discreet parts compared to a bit over a hundred in a modern phone. Building those in volumes of even thousands would have been impossible. There's no question that the personal phone was revolutionary. What do you think about how it has become a universal device? The "Smart Phone," with its ability to text, email, take pictures, play music, browse the Web, play games and more, is a wonderful technical achievement, but it is hardly revolutionary. Each of these functions can be performed by a separate, dedicated device that will almost always do a better job than a smart phone. Having them combined into one device is a great convenience for some people but that, in itself, is not revolutionary. Revolutions result in important changes in the lives of people and in their behavior. The freedom that results from being able to communicate wherever you are is revolutionary, and even today voice is still the "killer app" on cell phones, with texting being second. Does that mean that the wireless revolution is over? Actually, the wireless revolution is only beginning. More importantly, the ability to communicate wirelessly will engender several new revolutions in the coming years. The very existence of this conference is an indication of the birth of a radical change in the way healthcare is managed. We will laugh, someday, at the archaic concept of an annual physical examination. We learn very little about the health of an individual with the snapshot that comes from a periodic physical. With no personalized benchmark, we have to compare results with those of typical or average people. But we are different from each other; data that's normal for one individual may represent serious problems in another. Just imagine doing a thorough physical examination every hour – or every minute – and having the data continuously analyzed by a computer with triggers that get doctors involved when there is a trace of disease. What will it take to make that vision a reality? 6. Creation of the analytical algorithms that are needed to interpret the diagnostic data downloaded from people. Even more difficult is the necessity for serious focus on the human behavioral issues and techniques that promote change. Schools, practitioners, employers and, most especially, consumers will all have to embrace new attitudes and habits. Technology alone will not solve the healthcare problem. When can we expect to see the fruits of the wireless medical revolution? We are already seeing valuable medical applications, especially in the treatment of people in rural areas and in emerging countries. However, we need orders of magnitude improvement in the sensitivity of the sensors that detect the precursors of disease in people before these precursors actually become diseases. That alone will take at least 30 years to get to the point where the precursors of major diseases such as cancer, heart failure and diabetes can be detected at early enough stages to be prevented. In that period, medical research will have made great strides in disease prevention and we have a new generation of bureaucrats, lawyers and doctors who will bring new attitudes into the healthcare system. In this regard, even 30 years may be ambitious, but then, I have always been an optimist. What's the story of your transition from cell phones to wireless health? Even before cellular existed, my team developed the first nationwide radio paging systems. Our first customers were doctors; pagers dramatically improved their quality of life. My wife, Arlene Harris, in her family business, created the LifePage system in 1981 that provided pagers to people waiting for transplants. Our continuing passion for wireless health was truly ignited by Dr. Jay Sanders who is a thought leader in the wireless health arena and who shared his vision with us in the mid '90s. He continues to inspire us today.